National Westminster Bank, commonly known as NatWest, is a major retail and commercial bank in the United Kingdom. It was established in 1968 by the merger of National Provincial Bank (established 1833 as National Provincial Bank of England) and Westminster Bank (established 1834 as London County and Westminster Bank). Since 2000, it has been part of The Royal Bank of Scotland Group. Following "ringfencing" of the Group's core domestic business, the bank became a direct subsidiary of NatWest Holdings; NatWest Markets comprises the non-ringfenced investment banking arm. NatWest is considered one of the Big Four clearing banks in the UK, and it has a large network of over 960 branches and 3,400 cash machines across Great Britain and offers 24-hour Actionline telephone and online banking services. Today, it has more than 7.5 million personal customers and 850,000 small business accounts. In Ireland, it operates through its Ulster Bank subsidiary. In 2017, NatWest was awarded Best Banking App in the British Bank Awards. 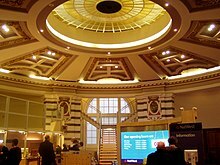 The bank's origins date back to 1658 with the foundation of Smith's Bank of Nottingham. Its oldest direct corporate ancestor, National Provincial Bank, was formed in 1833 as the National Provincial Bank of England. It acquired Union of London and Smith's Bank in 1918 to become National Provincial and Union Bank, shortening its name back to National Provincial in 1924. 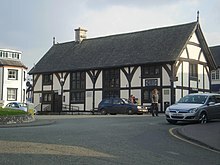 National Provincial bought District Bank (formerly Manchester and Liverpool District Bank) in 1962, but continued to operate District's branch network separately. Westminster Bank was founded in 1834 as London and Westminster Bank, eventually dropping the "London" portion in 1923. The creation of the modern bank was announced in 1968, and National Westminster Bank Limited commenced trading on 1 January 1970, after the statutory process of integration had been completed in 1969. The famous three arrowheads symbol was adopted as the new bank's logo; it is said to symbolise either the circulation of money in the financial system or the bank's three constituents, National Provincial Bank, Westminster Bank, and District Bank (established 1829): the latter had been taken over by National Provincial Bank in 1962 and was allowed to operate under its own name until the formation of National Westminster Bank. The District, National Provincial, and Westminster Banks were fully integrated in the new firm's structure, but private bankers Coutts & Co. (a 1920 National Provincial acquisition, established 1692), Ulster Bank in Northern Ireland (a 1917 Westminster acquisition, established 1836) and the Isle of Man Bank (a 1961 National Provincial acquisition, established 1865) continued as separate operations. Westminster Foreign Bank (established 1913) was restyled International Westminster Bank in 1973. Duncan Stirling, outgoing chairman of Westminster Bank, became first chairman of the fifth largest bank in the world. In 1969 David Robarts, former chairman of National Provincial, assumed Stirling's position. In 1975 it was one of the first London banks to open a representative office in Scotland. It was a founder member of the Joint Credit Card Company (with Lloyds Bank, Midland Bank and Williams & Glyn's Bank) which launched the Access credit card (now part of MasterCard) in 1972 and in 1976 it introduced the Servicetill cash machine. The same banks, excluding Lloyds, were later responsible for the introduction of the Switch debit card (later branded Maestro) in 1988. Deregulation in the 1980s, culminating in the Big Bang in 1986, also encouraged the bank to enter the securities business. County Bank, its merchant banking subsidiary formed in 1965, acquired various stockbroking and jobbing firms to create the investment banking arm County NatWest. National Westminster Home Loans was established in 1980 and other initiatives included the launch of the Piggy Account for children in 1983, the Credit Zone, a flexible overdraft facility on which customers only pay interest (now commonplace, this so-called pink debt was innovative when launched) and the development of the Mondex electronic purse (later sold to MasterCard Worldwide) in 1990. The Action Bank advertising campaign spearheaded a new marketing-led approach to business development. Under the direction of Robin Leigh-Pemberton, later Lord Kingsdown, who became chairman in 1977, the bank also expanded internationally, forming National Westminster Bancorp in the United States of America with a network of 340 branches across two states, National Westminster Bank of Canada and NatWest Australia Bank; and opening branches on the European continent and in the Far East. In 1982, the Frankfurt office of International Westminster Bank merged with Global Bank AG to form Deutsche Westminster Bank. In 1985, Banco NatWest España was formed and National Westminster Bank SA was incorporated in 1988, taking over the bank's six branches in France and Monaco. In 1989, International Westminster Bank was merged into National Westminster Bank by Act of Parliament. Completed in 1980, the bank built the National Westminster Tower (now known as Tower 42) in London to serve as its international headquarters. 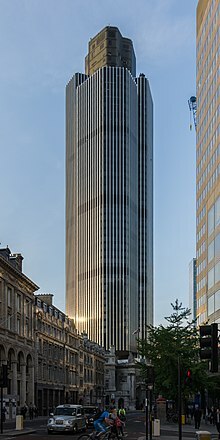 At a height of 600 feet (183 m) it was the tallest building in the UK until the topping-out of Canary Wharf Tower 10 years later; its footprint loosely approximating the bank's logo when viewed from the air, although the architect claimed the similarity was coincidence. Also worthy of note is National Westminster House (since renamed as 103 Colmore Row) in Birmingham: the building was sold to British Land in 2007 and demolished in 2015. The bank's expansion strategy hit trouble with the stock market crash of 1987 and involvement in the financial scandal surrounding the collapse of Blue Arrow. The Department of Trade and Industry report on the affair was critical of the bank's management and resulted in the resignation of several members of the board, including then chairman Lord Boardman. Later, the bank would divest its overseas subsidiaries. The North American operations were sold to Fleet Bank and Hong Kong Bank of Canada, and the Australian and New Zealand branches were sold to Salomon Smith Barney and the National Australia Bank. Thereafter the bank concentrated on its core domestic business as the restyled NatWest Group, reflecting its modern positioning as a portfolio of businesses. 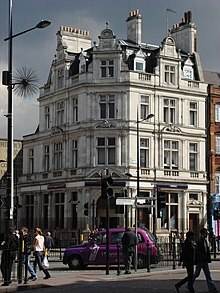 In 1993, the NatWest Tower was devastated by a Provisional IRA bomb and the bank vacated the building and later sold it. Then, in 1997, NatWest Markets, the corporate and investment banking arm formed in 1992, revealed that a £50m loss had been discovered, revised to £90.5m after further investigations. Investor and shareholder confidence was so badly shaken that the Bank of England had to instruct the board of directors to resist calls for the resignation of its most senior executives in an effort to draw a line under the affair. The bank's internal controls and risk management were severely criticised in 2000 and its aggressive push into investment banking questioned, after a lengthy investigation by the Securities and Futures Authority. The bank's move into complicated derivative products that it did not fully understand seemed to indicate poor management. By the end of 1997 parts of NatWest Markets had been sold, others becoming Greenwich NatWest in 1998. In 1999, the chairman, Lord Alexander of Weedon, announced a merger with Legal & General in a friendly £10.7 billion deal, the first between a bank and an insurance company in UK history. The move was poorly received in the London financial markets and NatWest's share price fell substantially. Seen as a driver of the ill-advised investment banking expansion, Derek Wanless was forced to resign as chief executive following the appointment of Sir David Rowland (who became executive chairman). Also in 1999, in response to the much reduced NatWest market capitalisation, the much smaller Bank of Scotland made a hostile takeover bid for NatWest. The Bank of Scotland's aim was to break up the NatWest Group and dispose of its non-retail assets. NatWest was forced to abandon its merger, but refused to agree to a takeover by a rival bank. The Royal Bank of Scotland tabled another hostile offer and trumped the Bank of Scotland with a £21 billion bid. The takeover of NatWest in early 2000 was the biggest in UK history. National Westminster Bank, once Britain's most profitable bank, was delisted from the London Stock Exchange and became, with its subsidiaries, component parts of the Royal Bank of Scotland Group. The outcome of this bitter struggle set the tone for a round of consolidation in the financial sector as it prepared for a new age of fierce global competition. The Royal Bank of Scotland Group became the second largest bank in the UK and Europe (after HSBC) and the fifth largest in the world by market capitalisation. According to Forbes Global 2000, it was then the 13th largest company in the world. NatWest was retained as a distinct brand with its own banking licence, but many back office functions were merged with those of the Royal Bank, leading to over 18,000 job losses. In 2008, it was announced that HM Government would take a stake of up to 58% in the Royal Bank of Scotland in a move aimed at recapitalising the Group. HM Treasury subscribed for £5 billion in preference shares and underwrote the issuance of £15bn of new ordinary shares offered to RBS shareholders and new institutional shareholders at the fixed price of 65.5p. As a consequence of the mismanagement which necessitated this rescue, the chief executive, Fred Goodwin (who secured the takeover of NatWest), offered his resignation, which was duly accepted. Chairman Sir Tom McKillop also confirmed he would stand down from that role when his contract expired in 2009. Goodwin was replaced by Stephen Hester, previously chief executive of British Land. In 2009 the RBS Group announced that it would divest all 311 RBS branches in England and Wales (until 1985, Williams and Glyn's) together with the seven NatWest branches in Scotland as a standalone business, to comply with European Commission state aid requirements. In August 2010, it was announced that the branches would be sold to Santander UK, along with the accounts of 1.8 million personal customers and 244,000 SME customers. Santander withdrew from the sale in October 2012. On 27 September 2013, the RBS Group confirmed it had agreed to sell 308 RBS branches in England and Wales and 6 NatWest branches in Scotland to the Corsair consortium. This figure was reduced to 307 by May 2015. The branches were to have been separated from the group in 2016 as a standalone business operating under the previously dormant Williams & Glyn's brand. In August 2016, RBS cancelled its plan to spin off Williams & Glyn as a separate business, stating that the new bank could not survive independently. It revealed it would instead seek to sell the division to another bank. In February 2017, HM Treasury and the European Commission reached a provisional agreement in which RBS would be able to retain the Williams & Glyn assets in return for investing £750 million into a fund aimed at increasing SME lending by challenger banks and for RBS agreeing to allow SME customers of challenger banks to use its branch network for cash and cheque handling. The European Commission confirmed in April 2017 that it would scrutinise the proposal. On 20 March 2017 the British paper The Guardian reported that hundreds of banks had helped launder KGB-related funds out of Russia, as uncovered by an investigation named Global Laundromat. NatWest was listed among the 17 banks in the UK that were “facing questions over what they knew about the international scheme and why they did not turn away suspicious money transfers,” as the bank processed $1.1 million in Laundromat cash. Other banks facing scrutiny under the investigation included HSBC, the Royal Bank of Scotland, Lloyds, Barclays and Coutts. Ulster Bank Limited, incorporating, from 2001, Ulster Bank Ireland DAC, Dublin. Structurally, National Westminster Bank was a wholly owned subsidiary of The Royal Bank of Scotland Group until 2003, when ownership of the bank's entire issued ordinary share capital was transferred to The Royal Bank of Scotland as holding company, with RBS Group functioning as ultimate holding company. At the same time the entire issued share capital of Lombard North Central Plc was transferred by the bank to the holding company, transferring back to NatWest in 2017. Ownership of National Westminster Home Loans Limited was passed to the holding company in 2005; however, the mortgage portfolio and related funding were also transferred back to NatWest in 2012. In 2000, the bank transferred National Westminster Life Assurance Limited to RBS Life Investments Limited, effectively establishing the business as a joint venture between the Group and Norwich Union. In 2018, ownership of both NatWest and the Royal Bank transferred to NatWest Holdings Limited, a direct subsidiary of RBS Group. The NatWest branch at St Helier, capital of Jersey, Channel Islands, built in 1873. The office is currently held ex officio by the chairman of The Royal Bank of Scotland Bank Group. The NatWest branch at Camden Town, London, NW1. NatWest provide a full range of banking and insurance services to personal, business and commercial customers, including the first dedicated bank account in Britain to be delivered and supported entirely in the Polish language. The bank has won Your Mortgage Magazine's Best Bank for Mortgages award 13 times in the last 17 years, more than any other lender. Operating under the name Esme Loans, NatWest provides a digital lending platform for SMEs also available to customers not banking with NatWest or RBS. Esme Loans was commenced trading from 17 February 2017, after being founded out of the banks new product development programme NatWest Innovation Cell by Richard Kerton, Veronika Lovett, and Lucy Hasson. The bank operates "mobile branches" using converted vans to serve rural areas around St Austell, Swansea, Carlisle, Devon and North Wales. The service allows to customers to carry out banking transactions in remote areas where there is no branch. NatWest reintroduced the mobile service in Cornwall in 2005, after HSBC ended its own version due to costs. In 2006, The Royal Bank of Scotland Group undertook the first trial of PayPass contactless debit and credit cards in Europe. The bank is introducing Visa Debit cards with the technology for current accounts, which can be used to pay for purchases up to £30 by tapping an enabled card on the retailer's terminal. In an effort to enhance security, hand-held devices for use with a card to authorise online banking transactions were introduced in 2007. These card readers do not retain personal information but verify numbers during a transaction. The bank participates fully in the Faster Payments Service, an initiative to speed up certain payments, launched in 2008. The bank established credit and debit card payment handling company Streamline in 1989, which was merged into RBS WorldPay in 2009. The NatWest Mobile Banking app is available to personal account holders over the age of 11 with online banking, a debit card and UK mobile telephone number (beginning 07). The Emergency Cash service gives access to cash without a debit card from NatWest, RBS and Ulster Bank cash machines. NatWest is a member of the Cheque and Credit Clearing Company Limited, Bankers' Automated Clearing Services Limited, the Clearing House Automated Payment System Limited and the LINK Interchange Network Limited. The bank is authorised by the Prudential Regulation Authority and regulated by both the Financial Conduct Authority and the Prudential Regulation Authority. It is a member of the Financial Ombudsman Service, the Financial Services Compensation Scheme, UK Payments Administration and of the British Bankers' Association; it subscribes to the Lending Code. Mortgages, available in England, Scotland and Wales only, are provided by National Westminster Home Loans Limited, a member of the Council of Mortgage Lenders, NatWest One account is a secured personal account with the Royal Bank of Scotland Plc. NatWest Insurance Services acts as intermediary and broker for general insurance, policies are underwritten by UK Insurance Limited. Life Protector and Guaranteed Bond products are provided by National Westminster Life Assurance Limited. RBS International trades as NatWest International in Jersey, Guernsey, the Isle of Man and Gibraltar. In 2010, RBS Intermediary Partners was renamed NatWest Intermediary Solutions. 01 former District Bank Ltd.
50-00 to 59-99 former National Provincial Bank Ltd.
55-91 in use by Isle of Man Bank Ltd.
60-00 to 66-99 former Westminster Bank Ltd.
18 for use of Coutts & Co.
98 for use of Ulster Bank Ltd.
International Bank Account Numbers take the form GBxx NWBK ssss ssaa aaaa aa, where x refers to a check digit, s to the branch sort code and a to the individual account number. The Bank Identifier Code, or SWIFT code, for NatWest (and Isle of Man Bank) is NWBKGB2L (8 digits) or NWBKGB2Lxxx (11 digits). The so-called NatWest Three — Giles Darby, David Bermingham and Gary Mulgrew — were extradited to the United States in 2006 on charges relating to a transaction with Enron Corporation in 2000 while they were working for Greenwich NatWest. It has been argued that the alleged crime was committed by British citizens living in the UK against a British company based in London and therefore, any resulting criminal case falls under the jurisdiction of the English courts. However, the Serious Fraud Office decided not to prosecute due to lack of evidence. There has been criticism that the Americans do not have to produce a prima facie case, or even a reasonable one, to extradite British citizens, whereas no such facility exists to extradite US citizens to the UK. On 28 November 2007 the three admitted one charge of wire fraud after a plea bargain. On 22 February 2008 they were each sentenced to 37 months in prison. Following discussions between the Office of Fair Trading, the Financial Ombudsman Service, the Financial Services Authority and the major banks, proceedings were issued on 27 July 2007 in a test case against the banks to determine the legality and enforceability of certain charges relating to unauthorised overdrafts. It is argued that these are contrary to the Unfair Terms in Consumer Contracts Regulations 1999; Schedule 2(e) of which gives a non-exhaustive list of terms which may be regarded as unfair, such as a term requiring a consumer who fails in his obligation to pay a disproportionately high sum in compensation. Penalty charges are irrecoverable at common law. The precedent for this was Dunlop Pneumatic Tyre Co. Ltd. v New Garage and Motor Co. Ltd.  AC 79 along with Murray v Leisure Play  EWCA Civ 963, where it was held that a contractual party can only recover damages for an actual loss or liquidated losses. The Royal Bank of Scotland Group maintained that its charges were fair and enforceable and stated it intended to defend its position vigorously. On 24 April 2008, the High Court found that although these charges could not constitute penalties, they are challengeable under the Unfair Contract Terms Act 1977 and the Unfair Terms in Consumer Contracts Regulations 1999. On 26 February 2009, the Court of Appeal ruled that fees for unauthorised overdrafts and bounced cheques are subject to regulation by the OFT under these rules. In September 2009, NatWest and RBS both announced dramatic cuts in their overdraft fees. The unpaid item fee was reduced to £5 from £38 and the card misuse fee was reduced from £35 to £15. The cuts came at a time when the row over the legality of unauthorised borrowing, estimated to earn current account providers about £2.6bn a year, had reached the House of Lords. In late June 2012, the group suffered a major computer malfunction, resulting in some customers' account balances not updating correctly. Completions of some new home purchases were delayed, customers were stranded abroad, another was threatened with the discontinuation of her life support machine in a Mexican hospital, and one man was held in prison. As a result of the error, RBS and NatWest announced that over 1,200 of their busiest branches would extend their hours throughout the week, including the bank's first Sunday opening, to enable the customers affected to access cash. On 25 June, over 1,000 branches opened for extended hours, and the number of phone staff was doubled. Some customers also reported problems with direct debits and standing orders being returned unpaid due to their account balances not updating correctly. However, RBS stated in an announcement that they would work directly with the receiving banks and companies to ensure that all payments were processed. As a result of the system outage, RBS also announced that they would work with credit rating agencies directly to ensure no customer's credit file was permanently impacted. They also announced that no customer would be permanently out of pocket because of the system outage, and launched a dedicated new freephone helpline for the incident, as well as an online help point to guide and advise customers with any queries they had during the outage. In December 2013, a similar computer failure led to a number of customers being unable to use NatWest card services to pay for goods. This second major outage of services fell on what is known as Cyber Monday, when major retailers discount goods to boost Christmas shopping. The chief executive of RBS Group conceded that the bank would have "to do better". The name NatWest has been associated with cricket tournaments held in England. From 1981 until 2000, the bank was the title sponsor of English domestic cricket's main limited overs knockout tournament, which was known as the NatWest Trophy during that period. Between 2000 and 2013, the NatWest Series was an annual one-day international tournament involving England and two visiting international teams. NatWest were also a main sponsor of the 1999 Cricket World Cup, held in England. Since May 2017, it has been the shirt sponsor for the England men's and women's cricket teams. The bank also sponsored England's Test series against Pakistan in 2018. NatWest is sponsor of the Southern Paintball League, the leading competitive paintball series in the south of England. NatWest has been the main sponsor of the Island Games (known as the NatWest Island Games) since 1999 and has announced that it will continue to sponsor the event until 2019. NatWest CommunityForce is "a platform that empowers local projects and charities to raise awareness of their work and make their plans a reality with the support of NatWest and their local community." ^ "'Big four' banks lost quarter of a million current account switchers last year - and Barclays was the biggest loser". DMG Media. 22 July 2015. Retrieved 11 February 2018. ^ "RBS and NatWest to shed 158 branches and more than 400 jobs". BBC News. 23 March 2017. Retrieved 23 March 2017. ^ "Best Banking App". Smart Money People. Retrieved 23 April 2016. ^ "The Archive Guide: Samuel Smith & Co". The Royal Bank of Scotland Group. Archived from the original on 4 December 2008. Retrieved 5 April 2009. ^ Steven, Rachael (4 October 2016). "Old meets new in NatWest rebrand". Creative Review. Retrieved 7 October 2016. ^ "An Introduction to Building Structures". University of the West of England. Archived from the original on 22 February 2014. Retrieved 3 February 2014. ^ Pain, Steve (17 January 2007). "British Land snaps up NatWest building". The Birmingham Post. Archived from the original on 19 February 2008. ^ "NatWest in pounds 52m sell-off". Birmingham Post & Mail Ltd. 10 February 1998. ^ Wolfe, Eric (October 2001). "Case Study: NatWest Markets" (PDF). BancWare ERisk. Archived from the original (PDF) on 30 October 2008. ^ "UK banks' £37bn bail-out unveiled". BBC News. 13 October 2008. Retrieved 26 September 2013. ^ "RBS shares drop on surprise EU divestment demands". The Telegraph. 2 November 2009. Retrieved 2 November 2015. ^ "RBS sells 318 branches to Santander". BBC News. 4 August 2010. Retrieved 26 September 2013. ^ "RBS sale of 316 branches to Santander collapses". BBC News. 12 October 2012. Retrieved 26 September 2013. ^ MacLellan, Kylie; Slater, Steve (13 September 2015). "RBS appoints BoAML to ready 2016 listing of Williams & Glyn". Reuters. Retrieved 2 November 2015. ^ James Quinn (17 February 2017). "Royal Bank of Scotland calls halt to troublesome Williams & Glyn sale after Treasury strikes deal with Brussels". The Telegraph. Retrieved 18 February 2017. ^ Fraser, Douglas (4 April 2017). "RBS plan faces European Commission investigation". BBC News. Retrieved 5 April 2017. ^ "Annual Report and Accounts 2006" (PDF). The Royal Bank of Scotland Group. 28 February 2007. p. 46 sec. Operating and financial review, Description of business. Archived from the original (PDF) on 28 February 2008. ^ "Annual Report and Accounts 2006" (PDF). National Westminster Bank. 28 March 2007. p. 32 sec. 'Notes on the accounts, (14) Investments in Group undertakings. Archived from the original (PDF) on 20 March 2009. ^ "Annual Report and Accounts 2002" (PDF). National Westminster Bank. 27 February 2003. p. 2 sec. Report of the directors, Activities and business review. Archived from the original (PDF) on 22 October 2006. ^ "Annual Report and Accounts 2000" (PDF). National Westminster Bank. 28 February 2001. p. 17 sec. Report of the directors, Activities and business review. Archived from the original (PDF) on 8 December 2006. ^ "NatWest boosts Polish banking". This is Money. 27 October 2009. Retrieved 27 September 2014. ^ "New NatWest platform offers quick and easy loans to SMEs". www.rbs.com. Retrieved 18 September 2018. ^ "Advertising feature: ESME: The founders' story". Metro Newspaper UK. Retrieved 14 November 2018. ^ "High tech mobile branches bring banking services to more customers" (Press release). RBS. 24 April 2014. Retrieved 14 April 2016. ^ Prestridge, Jeff (12 July 2005). "NatWest launches rural bank on wheels". This is Money. Retrieved 27 September 2014. ^ "Your contactless debit card". National Westminster Bank. 2015. Retrieved 2 November 2015. ^ "Tax Rates & Allowances 2013–2014" (PDF). National Westminster Bank. April 2013. Retrieved 30 May 2013. ^ "RBS broker arm becomes NatWest Intermediary Solutions". Mortgage Solutions. 19 January 2010. Retrieved 2 November 2015. ^ Bank boss 'must pay price' for accounts shambles: RBS chief faces calls to forfeit another bonus as crisis is linked to IT team in India. Daily Mail. ^ Family¿s fears cancer girl could die in Mexico after NatWest computer glitch meant crucial funds could not be transferred. Daily Mail. ^ "RBS computer problems kept man in prison". BBC News. 26 June 2012. ^ a b Hall, James (25 June 2012). "RBS glitch 'well on the way' to being fixed, says chief". The Daily Telegraph. London. Retrieved 25 June 2012. ^ Adetunji, Jom (23 June 2012). "NatWest 'technical glitch' fixed, says spokesman". The Guardian. London. Retrieved 25 June 2012. ^ Peachey, Kevin (25 June 2012). "NatWest computer failure: Your rights Q&A". BBC News. Retrieved 4 December 2013. ^ "RBS must do better after payment fault, says boss". BBC News. 3 December 2013. Retrieved 4 December 2013. ^ Hoult, Nick (6 January 2017). "Investec pulls out of 10-year £40m deal to sponsor Test cricket in England". The Telegraph. Retrieved 7 May 2018. ^ "About CommunityForce". NatWest CommunityForce. Archived from the original on 26 February 2012. Retrieved 30 October 2011.